Mrs. Anna Edson Taylor, a school teacher from Bay City, Michigan, celebrated her 43rd birthday on Thursday by going over Niagara Falls in a barrel. She is the first person, man or woman, who ever went over the Great Falls and lived to tell the tale of how her purpose was achieved. Her object was notoriety (says the " Evening News " correspondent) which she believed would enable her to get a music-hall engagement and thereby raise money to pay off a mortgage which is on her ranch in Texas. The barrel was 4ft. high and 3ft. in diameter. It had been previously sent over the falls with a cat in it as a test. Both the barrel and the cat withstood the shock. They went over the Horseshoe Falls on the Canadian side with a sheer drop of 158ft. The barrel was lined with cushions, and the woman was fastened to her place by straps. At five minutes past four o'clock she started. Twenty-three thousand spectators saw the barrel go over the Horseshoe Falls. 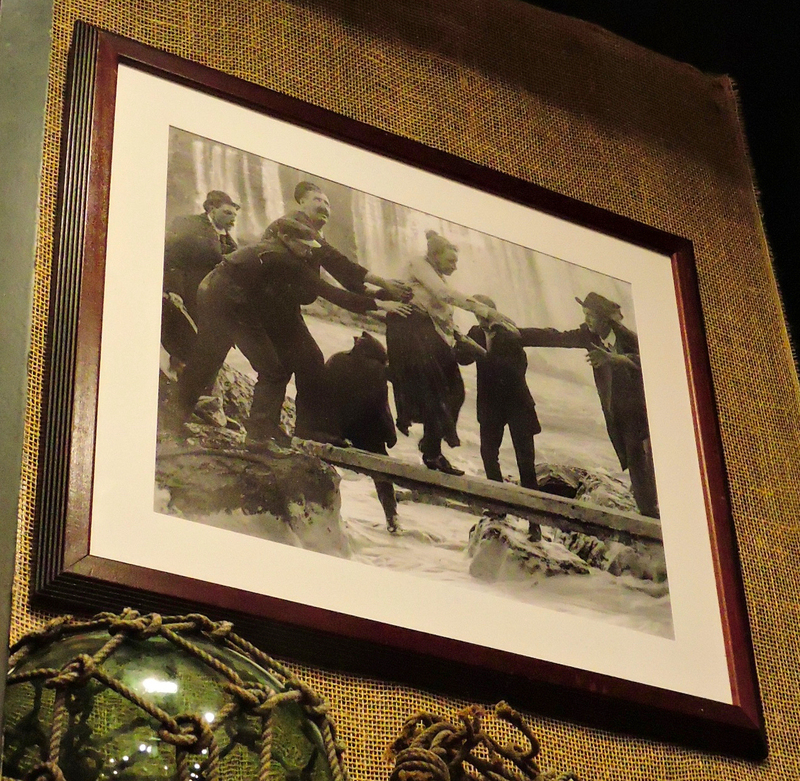 At 4.40 p.m. the barrel was captured and pulled on to the rocks, and the cover was broken open. Mrs. Taylor immediately raised her arm and waved her hand as a demonstration that she was still living. It was necessary to saw away a portion of the barrel, which was half filled with water, to get the woman out. She had a cut 3in. long on the back of her right ear; her shoulder was strained, and she suffered severely from shock. The doctors say she will be well in a few days. She said: I feel like offering a prayer that my life was spared. I feel sore about my shoulders. I am not a notoriety seeking woman, and have lived a quiet life. I was left a widow at twenty, and have devoted most of my life to others. "If it was with my dying breath, I would caution anyone against attempting the feat. I will never go over the Falls again. I would sooner walk up to the mouth of a cannon, knowing it was going to blow me to pieces, than to make another trip over the Falls. I was swirled about like a top, and the water seemed to come in on me in bucketfuls. I held tightly to the handles and thought only of preventing my head from striking the top of the barrel. Once, for a moment, I seemed to lose my senses. I struck the rocks three times. I made the trip voluntarily, but I would not do it again for a million dollars. My husband was a good man. I don't know how I can thank you all for being so kind to me." 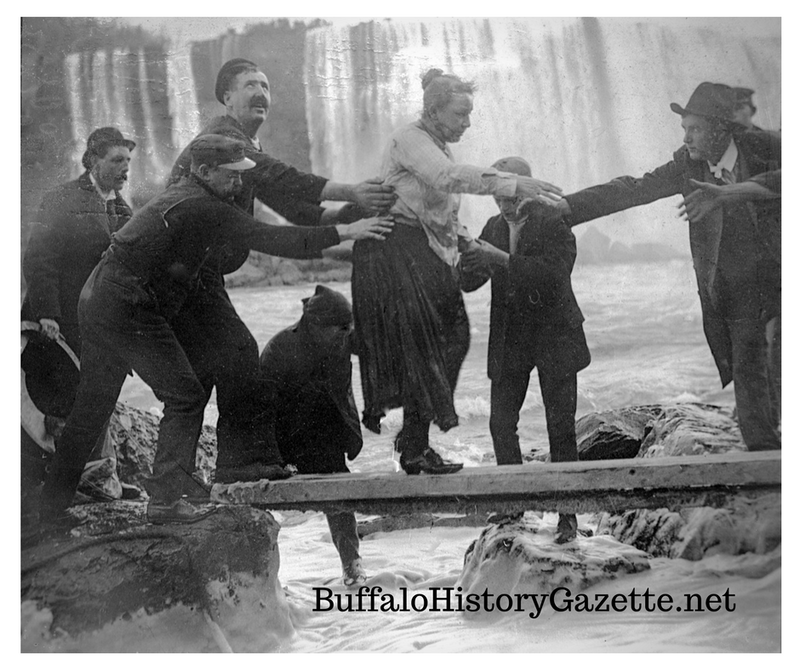 This famous photo is being featured this week at the Buffalo History Gazette Store in the Niagara Emporium at Eastern Hills Mall. It is a matted photo, 16x20 in a 20x24 frame. Picture is from the Buffalo History Gazette Collection from an original glass plate negative of this event, and not a copy from the internet. 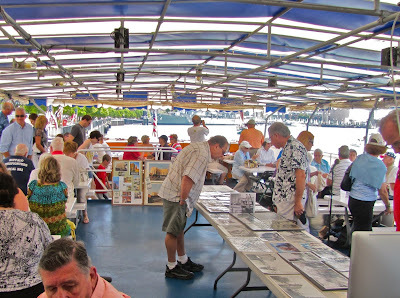 The Historic Buffalo River Tour is now in it's 34th season. 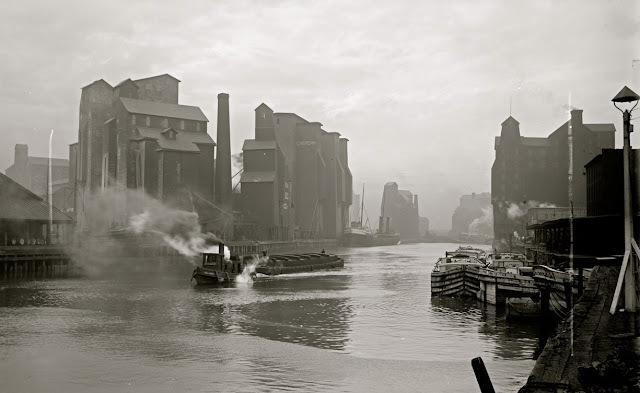 So much has changed on our waterfront since the day the Industrial Heritage Committee had the then "crazy" notion to shuttle people up and down the Buffalo River on small private boats in 1985 to see the Grain Elevators. Maybe we WERE a little crazy then but our faith in the idea was realized when demand quickly outgrew our meager means of carrying passengers. 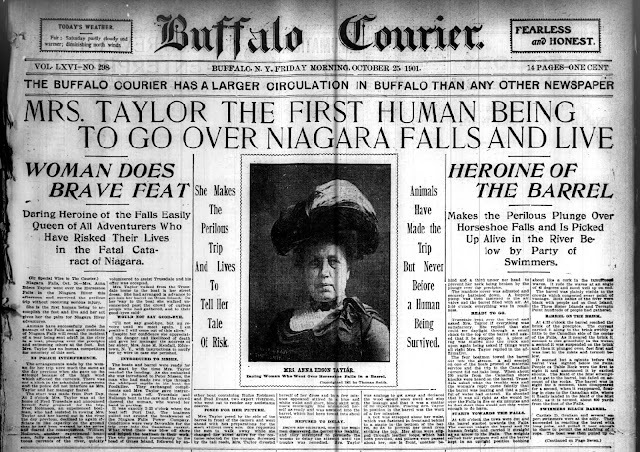 We took a leap of faith and turned to the "Miss Buffalo" to handle our problem. 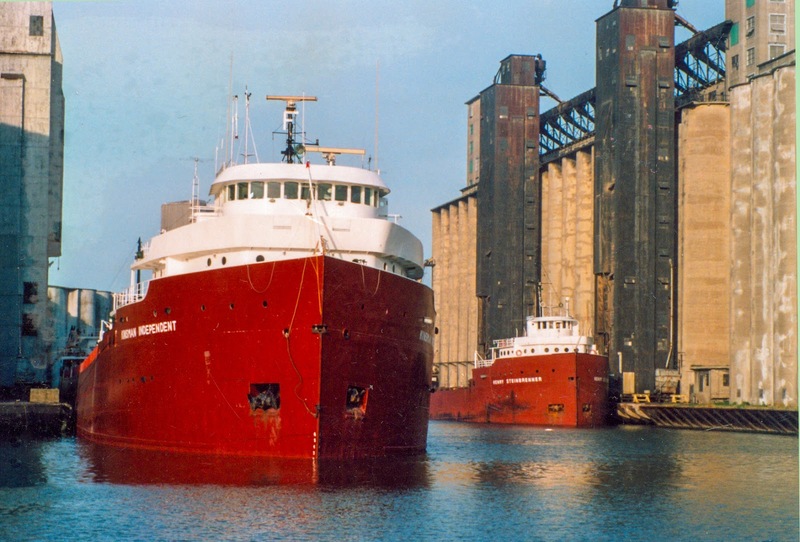 As demand warranted we sometimes had to run two of their boats on the same trip and probably could have run three but for lack of manpower. We were on to something and very excited! No one before us had done this, taking this mysterious, forgotten part of the city and making it a tourist attraction. Then Universities mostly from Canada but U.B was involved too, started booking our tour as a regular part of their academic programs. York University was a regular every year along with Carleton University and others that I can't remember right now. Back then ships were a common sight at the elevators, oil barges going up to the Mobil refinery, the sand boat, coal barges to the Huntley Station, cement boats to the Huron Cement elevator etc. Some of that is still there but on a far lesser scale. Ohio Street was still a street with remnants of its' industrial heritage still holding on. 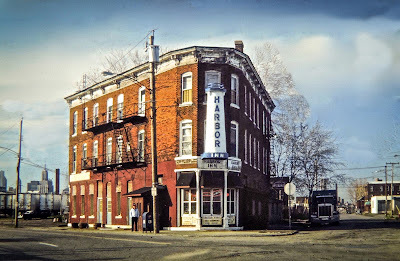 The Harbor Inn, the centerpiece of Ohio Street, was a thriving "Visitor Center" to travelers from around the world along with truck drivers, sailors, steel, flour mill and RR workers, grain scoopers, downtown office workers, politicians and more, a regular melting pot of occupations. It was doing what it had done for the previous 116 years and doing it well, but new things were in the mix. What was new to the Harbor Inn was it becoming the home and meeting place for the many preservation organizations, then in their infancy, beginning to set the stage for the many battles they were anticipating in the future as Buffalo began it's transition from industrial center to who knows what? No one really knew then. But the "planning" meetings and battles were on for the next three decades. 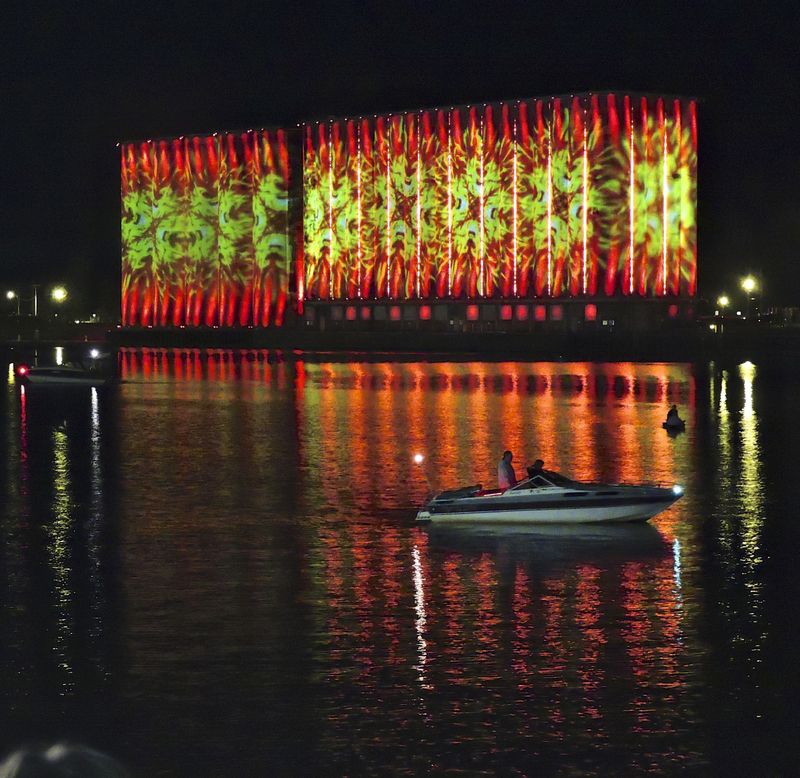 The Industrial Heritage Committee, Inc. believed then, as now, the Grain Elevators are the most historically significant architecture in Buffalo with a world wide recognition and importance, suitable for a UNESCO World Heritage Site and documentation by The National Park Service. The latter was achieved in early 1990s. So the Historic Buffalo River Tour continued as our platform to get the word out to the people, politicians and planners to include them in waterfront plans. Even though the tours continuously sold out year after year with people from every corner of the planet(and maybe beyond) it seemed to be falling on deaf ears of the local "powers that be." 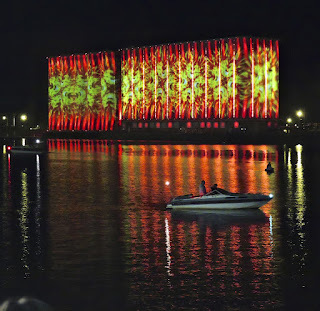 We had the world coming to Buffalo to see the elevators, but City Hall could not see them from just down the street. As other cities around this country and the world embraced their grain elevators and industrial heritage by making tourist attractions out of them and more, City Hall was intent on demolition and indifference. That's so Buffalo, stepping on it's own face. Only in the last few years has the attitude begun to change. A little. Too late for some of our most significant elevators that were needlessly removed in recent years instead of being repurposed with some very obvious re-uses that would have helped transition some neighborhoods. Some are now in the hands of "developers" which is scary in itself, others are in the hands of the city while a few are up and running as they should. At Silo City we have seen improvements and events there, but the general theme for the area has yet to be defined in my opinion. I know what I'ld like to do with the area but that's a whole other story. So here we are 33 years later still doing our tour among all new waterfront surroundings. It's funny in a way but 33 years ago I was a younger man naive and hopeful, talking passionately about Buffalos' great history and helping plan it's future. Now thinking back, I am part of that history I'm talking about today! There is a lot of pride in this tour I helped create which has endured all these years. 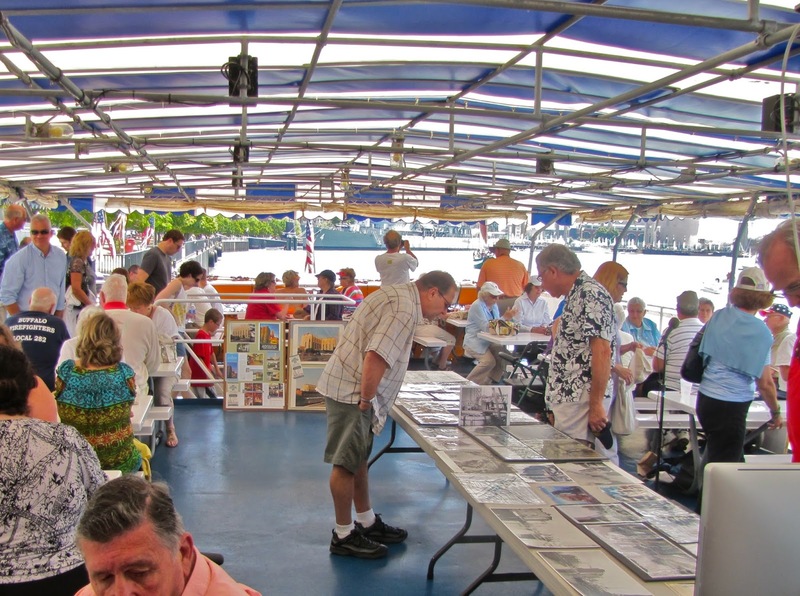 The tour has evolved from just a narrative of the surroundings to a "floating classroom" with old photographs, maps and video. Because of the ever changing waterfront the tour is never the same from year to year and even from tour to tour. So if you've been on before come back again and bring a friend. And If you've been curious about the elevators but haven't been on our tour then now is your chance in this fresh new season. Have a group? Get your tickets well in advance. Yes, there are others who have jumped on the bandwagon of late with their own version of a grain elevator tour for which we are often confused with, (a similar name), but quoting some old advertisement, you've tried the rest now try the best. Experience does count. And please! The Historic Buffalo River Tour boards at Erie Basin Marina, NOT Canalside, don't look for us there.